When I realized that it was almost time to catch a flight for Richmond I found it difficult to believe that I was even signed up to run a marathon. After running Steamtown on 10/9, I had hardly gotten in any miles. An even more ominous omen was that my trousers were now fitting a little tighter thanks to the junk I had been eating lately. So it was going to be an interesting race to say the least. I had told myself that I would not run a marathon unless I felt that I could shoot for a sub-3:30 (merely running to finish seemed pointless) so this was the very least I would be satisfied with. 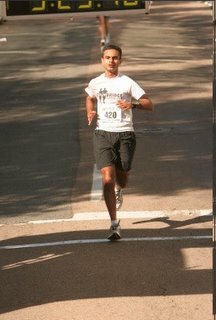 Apart from that I had no other goals so I felt surprisingly relaxed right up to the start of the race (I even slept well the night before the race). I went for the course tour organized by the Richmond Road Runners, which ended up being very useful during the race. It was nice to know what to expect at every point of the race. The course had appeared hilly during the tour but luckily these inclines were not that perceptible while running the race. I also noticed that 26.22 miles was quite a long distance - the tour kept going on and on (luckily this was not my first marathon!). After the tour Carter (Zipper) gave Jane (Mooky) and me a ride to the dinner FE. It was quite a turnout with Thomas (Thomas113), Joe (Shoeless), Wally (jdw113), Rick (nooner), Jennifer (JValentine), Bruce (TheBeast), runcam, dougal (Phil? ), papajohnw, Doug (RunnerDoug), Gary(Radice) and perhaps a couple of others who I missed. The food was great - I was one of the few who managed to finish the enormous portions. On the morning of the race I looked over and over again in the lobby of the Marriot for the pre-race FE but I could not find it (I should have read the FE thread more carefully). I had intended to start off with Rick and Jennifer and stick with them for as long as possible but I could not locate them at the start either. I had no idea as to what sort of pace I would be able to maintain so I had decided that I would go by HR and see how I felt after the first five miles. In the next 2-3 miles I started getting passed by hordes of runners. One runner even had a 3:30 pace group sign pinned on himself (Interestingly I would pass a lot of these folks later on). I loved Monument Ave - what a lovely stretch. They had some "Pick your goal" signs, listing famous times - Tergat, Ruiz, Gore, Oprah etc. I though this was pretty neat. The guy who gave us the course tour was manning the water stop at this mile. I enjoyed the long downhill and used it as a chance to get my HR down. As we approached the bridge I heard them playing "I'll Survive". I tried to carry some of the momentum from the downhill to the bridge. The next couple of miles were along the James river. I spent some time admiring the peace and tranquility of the river. I heard someone call out - 'Are you Sub?' I turned around to see Mike (Anson). He did not come to the dinner on Friday so it was so nice to run into him. He was well ahead of pace and well on track to go sub-3:30! My half split was about a minute off Steamtown. It was also unlikely that I was going to pull off anything Steamtown-esque in the second half. However I decided that I really needed to hold onto what I could. Ah, another nice downhill to enjoy before I have to deal with the bridge. Onto the bridge... Luckily there was no wind this year but this was the only time during the race that it did feel warm with the sun on my back. I could also feel the concrete surface. An old lady had made it to the bridge to cheer the runners! At some point around here I believe there was a "junk food" stop or something. I though I was getting water and instead got cola. I threw it away without taking a sip. Luckily there was water soon after. I was gradually beginning to fade. Well, I knew I that the Steamtown last 10k wouldn't happen at every marathon. The course had entered the "ugly" industrial part of town. Pretty much in synch with the way I was feeling now. I tried to keep this split below 8:00 but a smallish hill took care of that. Luckily this was downhill. Else it would have been so much more difficult. As I was reaching the finish line I told myself, "Don't think about your finishing time. You can run a marathon and no-one can take that away from you!" Considering that this was my second marathon in 5 weeks and sixth in 13 months I'm pretty satisfied with being able to hold onto an even split. This was also my second fastest marathon time so that was nice. As soon as I finished, I ran into Shoeless (Joe) - he'd blown his BQ time. That made me happy (I might never BQ so I will be feeding off other people's joy). Then I saw nooner (Rick), he'd finished a minute ahead of me - maybe if I had located him at the start I could have hung onto him for a bit during the race. Finally, I saw Gary (Radice), he had gotten his 2007 BQ with plans for a holiday in Italy in 2006 instead of Boston. 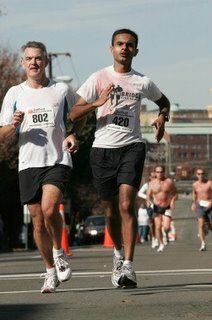 After I got my massage it looked like my legs had not gotten as beaten up as my previous marathons. I could walk down stairs comfortably - this usually took me about three days post-thon. I wonder if this was because of the course topography or because of my diminished aerobic fitness? I also spent some time at the finish line cheering the 5-6 hour marathoners - it was inspiring to see them cross the finish line.